The music business has many aspects. No two labels, publishers, managers or promoters work exactly the same way. There’s a decent overview of many aspects on Daz Smith’s Music Business Resources web site and more on this BPI page. All these and many others (accounting, merchandising, PR, etc.) would call themselves part of the music business. The record industry often calls itself the music business, and they stress this in their recent IFPI report. That makes them sound quite grand but they only play a small part and most musicians will only encounter a big label when they buy a Led Zeppelin CD. The current “crisis in the music business” is really in part of the record industry and part of music retail. 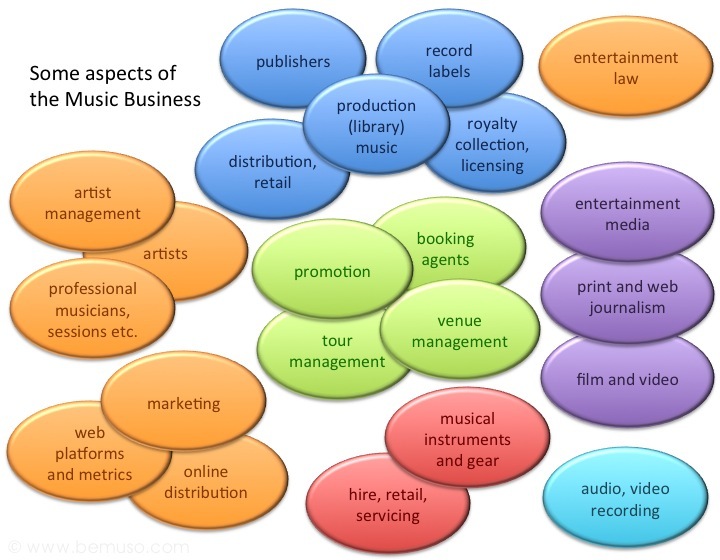 On this site music business is a general term for commercial activities—other than writing and performing—that support an artist or a band, with or without managers, labels or publishers. In the Music DIY section I describe how to deal with these in practice. You probably know more than I do about other aspects: studios, touring, merchandise, gigs, promotion and so on. In the Articles section I look at some related issues and offer my opinion. There is a basic guide to the Internet and setting up your own site but if you are completely new to computers you’ll need some extra help. I don’t cover audio although there are tips on home recording, CDs and audio formats. I spent several years using all the big home recording computer software systems and found them expensive, unreliable, time-consuming and user-hostile. I could write a book about my music software nightmare but I also know some people are quite happy working that way. The only system that completely worked for me was Atari with Notator and Unitor. I’d cheerfully use that again if I didn’t use hardware these days. A much better guide to home recording is this excellent (the first 15 pages) thread on the Cockos Reaper forums. I don’t have any ready-made legal agreements. A lot of people ask for forms and legal wording but it isn’t something you want to play around with. If you can’t afford or don’t want to use a lawyer, stick to plain English. It’s far better to write out your band agreement in English and all sign it, than to use a 25 page contract off the Internet that nobody understands. It is important to understand legal jargon but you don’t need to write it. There are 800 external links on the site but I don’t attempt to keep a complete directory of music sites and services here. You need to collect your own record label, distribution and publishing contacts, and you should get up-to-date recommendations for duplication, CD media, etc. from good music or technology forums. I recommend the Unsigned Guide as a good general music directory for DIY artists. It also has several good articles about the business and weekly news email for subscribers. I don’t cover promotion techniques here although I describe some so-called promotion schemes and ineffectual middlemen. There are genuine promotional services but you always need to prepare your own message. Promotion is simply getting the attention of your potential market. CD distribution and promotion are closely related. Some people think downloads have eliminated distribution but physical distributors always do some promotion (sometimes a great deal). Online distributors also feature some releases more than others—the iTunes Store front page is a prime promotional space. You must have an audience. Who are they? Do you know? If you don’t know you need to find out... otherwise you won’t reach them. The world is big and media grapeshot is expensive. Some people find their audience by flooding everywhere with stuff... but that’s not promotion, it’s spam. It’s why unsolicited demos have such a high failure rate. Mass media is expensive, but more than that it comes back to point 1... there’s no point getting your stuff on mass media if your audience isn’t there. Online promotion and visibility work the same way as the real world always did although there are some new tools (email, links, blogs, podcasts, web radio, downloads, community sites, etc.). Contrived new age mumbo jumbo such as viral marketing and street teams are hype. Buzz marketing is consultancy nonsense, it’s nothing new. The real thing (word of mouth and fan support) is still the most effective promotion. It always was. New-fangled tools don’t change that. Getting on the Internet is not promotion. A link exchange is not promotion. Setting up a band site is not promotion. Uploading your tracks to an MP3 host is not promotion. Setting up a Wikipedia entry linked to a YouTube channel is not promotion. Hiring a redundant Major label pen-pusher who now calls himself a Media Consultant is not promotion. Sending promos to radio is not promotion. A presence on MySpace, Facebook or Twitter is not promotion, even with a thousand spam-friends or followers. There is a great deal to say about the nuts and bolts of the live music industry and merchandising but I’m not the man to tell you and so far I haven’t found a good guide anywhere.